Let's Review Now, Shall We? I'll be boarding an airplane at about this time this post is set to post, off to Texas to be with my dad. I still have posts set to publish while I'm gone - of course. Through it all, I still read. It's still my vice. It's still my comfort. I haven't really mentioned what all I've been reading over at 5 Minutes for Books lately so that I thought I'd highlight some of my recent favorites in case you happened to miss them. (We can't have THAT happening now, can we?) Parish the thought!!! 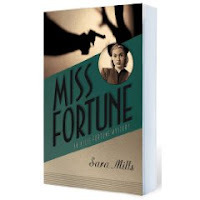 For starters, I recently read a (relatively new) mystery series - the Allie Fortune Mysteries - by Sara Mills which is published by Moody Press. These mysteries fall into the Christian fiction catagory but I didn't think faith was featured very heavily. I would rather refer to these as "clean reads" and that they are. I really enjoyed this series more than I thought I would. (I know, I know...I typically have such low expectations of Christian fiction for a myriad of reasons but I was extremely pleasantly surprised this time!) In fact, I liked the first book so much that I followed up with the publisher for a chance to read the second. That good. Really. Very entertaining and just plain fun. Furthermore, Moody is giving away two copies so if you'd like to win (provided the contest doesn't close by the time I post this), go leave a comment on my post over at 5 Minutes for Books. Secondly, I read The Power of a Woman's Words which is a Harvest House publication. (By saying it's a Harvest House book I'm pretty much saying it's a great book right then and there.) This book was impacting, influential and, well, why don't you just go read my post in full to find out what I thought about that book. I get a lot of review books due to my stint at 5 Minutes for Books. Lots I pass on keeping for myself. This book landed on my shelf (close by the Allie Fortune mysteries, btw) because I think I'll probably need to reread it at some point. Lastly, I read Shame Lifter which is offered by Tyndale House. This was another good book although it's impact on my personal life somewhat surprised me. I'm a rather confident individual and I didn't expect to *need* this book. Mostly I was just curious about what author Marilyn Hontz had to say on the subject matter of shame filled women (more or less). It's a very good book, solidly based on scripture and I found myself feeling extremely enthusiastic about Hontz's message. It's one to keep in mind, for sure. As always, I have a lot of fun reading and reviewing at 5 Minutes for Books. But the benefits and blessings are always made abundantly clear to me when I hit on just the right book which delights me. I love it when I LOVE the books that I'm sent to read and these three rank high on my Books to Love list.